Main façade of Theology Quadrangle, now known as Bosworth Hall. Cass Gilbert, with Cass Gilbert Jr.
From 1908 to 1931, Cass Gilbert was the consulting architect to Oberlin College in Ohio. As consulting architect, Gilbert undertook the design of several campus buildings. His first building on campus was Finney Chapel (1906-1908), while the last was the Graduate School of Theology, a quadrangle complex, which was completed in 1931. For all of his Oberlin designs, Gilbert referenced the styles of medieval and Renaissance Europe. His material palette for Oberlin was simple: roofs of red clay tile and walls of tan stone. Gilbert's initial designs for the Theology School were drawn between 1917 and 1920; however, nothing was built for more than a decade, due to inadequate funding. The Quadrangle was completed in 1931, after the college received a gift of $400,000 from the Rockefellers. At the behest of the college, Gilbert met directly with John D. Rockefeller Jr. to obtain the final $100,000. [Christen-2001 p 215] Most of the work was carried out under the supervision of Cass Gilbert, Jr. The Theology Building (now known as Bosworth Hall) and other quadrangle buildings together formed a campus-within-a-campus, including dormitories, classrooms, faculty offices, dining hall, chapel (now called Fairchild Chapel), and library. 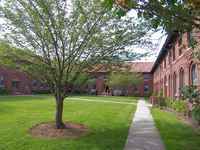 [Christen-2001 p 216] The Theology complex surrounds a courtyard, framed on four sides by classroom and dormitory buildings with linking colonnades. The Theology Building (Bosworth Hall) has a commanding presence on Tappan Square. 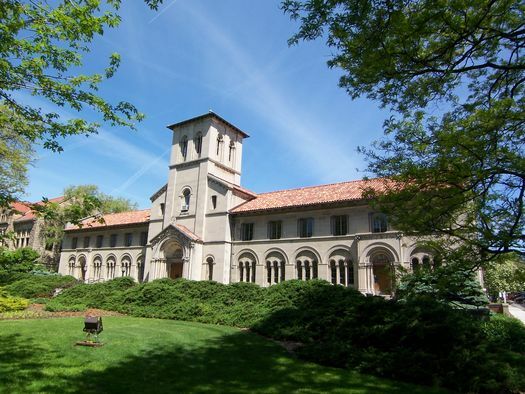 Its central feature is a Romanesque-inspired bell tower crowned by a hipped roof of Oberlin's signature red clay tile. 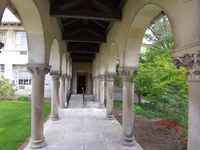 The arched entrance below the tower leads to the austere Fairchild Chapel. Colonnades both enclose the courtyard and connect Bosworth Hall to the rest of the former theology “campus,” now known as Asia House. 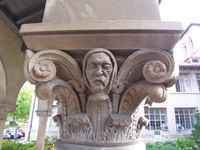 The covered passageways of the colonnade feature carved faces of Oberlin religion professors set in the capitals. 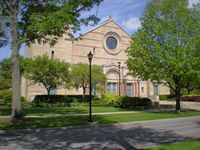 Oberlin ended its Theology program in 1965. Courtyard of the Theology Quadrangle, now Asia House.